With the help of chatbots, companies are creating great experiences for visitors to their website. The rise of Conversation Marketing shouldn't be ignored by anyone responsible for driving results through digital channels. 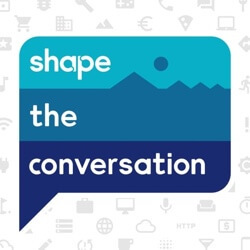 Jon and Nicole talk about the progression, usefulness, and future of chatbots in the digital world on this episode of 'Shape the Conversation'. Jon and Nicole talk about how they define the different types of chatbots and the massive changes that may be ahead as chatbots become even more prevalent. - Could chatbots completely replace websites for many businesses? Drift - The "new way businesses buy from businesses". Great for booking meetings with new prospects and sparking conversations with prospects visiting your site. Landbot - Great way to easily launch a chatbot with low risk. What we love about Landbot is the visual bot builder and options to implement your bot as a sidebar chat, embedded widget or take over the whole page with the bot experience. The best we advice we have is get out there and start experimenting because chatbots are becoming a larger piece of converting prospects to customers. If you don't have a chatbot strategy yet, you need to think hard about why. Nicole and I work together along with the great team here at shape.io in Bend Oregon. So some background about us. We left our agency jobs as marketers to build software for digital advertising teams. We'll be talking about working in marketing and growing shape.io on this podcast. Our goal is to delve in some of the experiences we've had tough lessons we've learned and give you some takeaways that maybe you can apply to your week and shape your own conversations. Why should you listen to us at all? We're a profitable SaaS company located outside of the Silicon Valley bubble. We were bootstrapped for two years before raising money in 2015 and since then we've grown the team and the customer base and lucky enough to learn a lot along the way. So let's delve into some of that and what are we going to talk about this episode Nicole? So on this episode we'll be talking about chat bots and how we kind of see them as a new realm of conversion rate optimization. But even further more will kind of be arguing about whether or not chat bots could eventually replace landing pages completely. So we'll be talking about that and the future where we see them going. I know this is one topic you weren't surprised to see pop up on our doc of ideas for podcast episodes. No I think you've been itching to do this one since the very start. Definitely yeah. I've been mildly obsessed with chat bots I think in 2018 and it's consumed a lot of my brainpower thinking about it so let's take one step back and we say chat bot what does that mean to you? Chat bot. Well and here's the problem because I think that definition is changing rapidly. But when I think of a chat bot I think about going to a Web site and interacting with an automated you know robot, if you will. That's there to greet me and then hopefully navigate me at least to my first step of that process on the website. I think it can also encompass messengers like Facebook Messenger and automated business messengers that they have as well. But what about you? Yeah I think I'm most familiar with them they're a little little chat bubble in the corner of the website. Man seems like over half the Web sites you land on these days, especially if it's any kind of software offering, has that little chat bubble there and whether it's manned by humans at all times or it's more of a live chat or a chat bot. I think that's the important distinction to me is like is it really a bot like is it programmed to do stuff or is it just a little button that you can quick live chat with somebody that may be more of an intercom type play. So I think it's really important to think about especially we look at everything a little bit through the lens of marketers and we obviously care a lot about what happens after so many clicks through an ad and ends up on a landing page of somebodies website. And if you're really changing the paradigm of how you're interacting with the Web site that you can sort of statically clicking around and maybe filling out a form if now you're jumping right into conversations. I think this is something that is going to touch every business that has a Web site and you need to be thinking about, is it right for us is it right for my client? Yeah so interestingly in my research on this topic, because I'm not as well versed right off the top of my head as Jon is, I found some really interesting stats. First one is that Gartner predicts that by 2020 customers will manage 85 percent of their relationships with enterprises without human interactions. Definitely something to be thinking of for businesses and that they also. Gardner also says by 2021 half of all enterprises will spend more on bot and chat bot creation than, air quotes here, "Traditional mobile app development" which cracks me up that now traditional mobile app development is a thing. When did that become traditional not novel? I know, the world It's moving fast really fast out there and I think chat bots have really arisen from honestly marketers I think abusing the landing page experience and in some cases and people are more hesitant today to maybe leave their email or their phone number or something on the forum on a Web site. And I think chat bots have proven to be really effective you've seen a lot of communication from Drift and their blog and their are no forms movement. And I think chat bots are becoming a way that I like interacting with new products I'm researching or new Web sites I don't know as much about if I can get some instant answers from chat bot it's nice. I think people don't like getting treated as much like a lead anymore. Like if you go to a website and leave your email you kind of know what that means. You're on some e-mail mailing list and I think that's really where chat bots or even a thing and now and marketers really need to lean into that and what you're saying is in terms of managing the relationship chat bots are going to have to get smarter and smarter in order to do that. Today I think most chat bots aren't there yet. No and I think you know chat bots haven't been called chat bots. In fact kind of that first pop up window where someone could chat with you. Actually was created in 1985. So they've been around for a while for a very long time the user experience was really poor. And I think that's what turned away a lot of people both B2C and B2B. But we're you know kind of with the buzz words more machine learning and AI. We're quickly getting to a place where people are able to have like, I mean like that said, you know potentially 85 percent of their interactions with an enterprise without talking to a human and it will be seamless. So I wholeheartedly agree with you that businesses need to be thinking about chat bots. This is the one topic when I bring it up with any business owner or not necessarily in the marketing space or in the SaaS space. This is something that's really interesting to them because they're also consumers and buyers you know we're all out there we all understand the type of information we want to leave and don't want to leave and I think this feeling of forms being less of a convergence source for a lot of companies is a real thing. You know I think why a company like Drift even exists if you drill down kind of in their DNA a little bit David Cancel current CEO, He worked for HubSpot. He was chief product at HubSpot nobody was better positioned to kind of see the general landscape of conversions and inbound forms being completed. And from that insider's look he saw like conversion rates were down. People didn't want to get treated like leads and that was a lot of the genesis of what he's trying to do with Drift and those chat bots and I think it's great for marketers because it's a whole new realm of CRO like conversion rate optimization that you can begin to think about package to your clients customers and you know people are going to want a different conversation whether landing on your pricing page or your product page. No it's absolutely it's personalization at scale more so than you could ever do with a single landing page. Well a single variation of a landing page copied 40 times over which is just not it's not feasible. I've tried it before. It's not. And that's you know in terms of the way we've worked with chat bots and implemented some on our strategies we'll get a little bit into the tools later on. But I've been really impressed with the engagement just we've seen implementing Drift on our site and the bot and kind of tailoring differing experiences based on who is seeing it or what page they're on and we have at least one to two people a day really interacting with the chat bot having conversations learning more about our product that I'm really not sure would have happened if if it wasn't there. Yeah it's it's really interesting I think. I mean we obviously are going to personalize that experience for someone who gets there from a blog differently than from our adverts campaigns differently from someone who finds it directly and that's even shaping the conversation to the pots having and where it's starting off. And I think it engages those customers more just because it is so personalized. And I look forward to thinking about and kind of strategizing even more that we can do in that realm. You mentioned from a from a marketing standpoint I think... I'm trying to remember what article it was. Let's see. So there was an article on CMSwire called "8 changes chatbots will bring to the workplace" and two the things that really stood out to me as they fully believe, or this article states that they believe that, one it could be a first point of contact for sales which is what we're talking about. But two from a marketing perspective they gave a really interesting idea and that's typically, and when you know B2B you tend to have a longer sales cycle you tend to go, as John said you know, go to find a landing page well do your research find the landing page fill out a form get that information. Maybe they try to drip you with them case studies they might send you an ROI calculator and eventually you know six months later you're making that purchase. And one of the things that they were talking about customizing for these B2B customers is taking things like case studies which can take a really long time to read through on white paper and actually making that a chat bot experience. The same thing with an ROI calculator. So instead of just inputting numbers and being like, "Great!" this isn't super dynamic. Actually being able to have that conversation with a chat bot. Yeah that's something we do on our pricing page. You walk through basically a pricing calculator to figure out your price. If you don't want to use the pricing page of the CAP the calculator there we see people going through that routinely. I think it shows too you put a little extra care a little extra step to help people get information on their own and not push people to a salesperson or you know somebody that's immediately going to try to get them on the phone trying to get a demo with them. And I think personally I think there's a lot of businesses that where the chat bots not just going to be a part of the Web site or a component of it and kind of down there in the right whatever. I do think there are situations when that chat bot could replace the Web site completely. And I think there are some examples out there where people are kind of pushing you into their chat bot experience. Great example is a company we will talk about again later on but Landbot landbot.io is their landing page. Now their whole business is around you know replacing websites with chat bots. But I think it's really interesting to think about instead of presenting people with navigation and all the things that might come with a traditional static Web site that maybe don't translate as well to mobile at all times if you're just opening a conversation and starting a chat with this business through a chat bot instead of a Web site like you go through a business landing page and instead it's like, "Hey how's it going? What can I do for you?" I think there are businesses or activities that the chat bot could overtake the landing page completely. And here's where I start to disagree because I've actually there are a lot of people who believe that chat bots not only will take over landing pages but they'll take over full Web sites as well. But you're still directing that chat or you're directing that person to a chat about that exists on a Web site so that website still has to load or that app potentially still has to load unless everyone's doing it natively in Siri or you know the Alexa ap that's where I sort of disagree. I think you're still going to a URL to get that chat bot experience. But instead of being presented with a navigation and then a landing page with some big image and a flashy tagline instead you're just presented with kind of like a blinking chat box you know like imagine if there was a text conversation just blown up to the Web site and you got to put a lot of thought and care into how you welcome somebody in that scenario. Now that's not an easy problem to solve and I think it'll be probably more simple B2C type products you see that maybe move into that first. But I do believe there's some scenarios where you could get information faster with the Chat bot. Shopping for instance like hey show me a red pair of shoes from Adidas as opposed to go into the navigation finding shoes, Adidas, Red or using their search bar. It's just you know an e-commerce site that says Hey what are you shopping for today. And you type that in and you're just presented with options and like you said that first step it gets you going. Yeah It's interesting. I mean because you're fully keeping chat bots to chat bots to because when you start thinking about chat bots and voice bots and that interaction that's a whole different story. I think we talked about it last week that that shopping experience gets a lot more convoluted. So I'm kind of interested to see how that starts to meld and mash you know kind of the voice side and the chat bot side. It's really actually interesting. I've got lots of articles this podcast. I know you're well prepared this week. Ninety five. I know he actually predicted that in 2018 the first major brand would actually shut down their entire website and give like that full experience in chat bot. But what interested me about this article and what you just said, and I hope I'm not diverting too much here, is that you were talking about how the process of like going to the navigation finding something like Red Shoes clicking through all that eventually getting to that search or that product that you wanted. It's frustrating, takes a while. Right? And what Rob actually says is that originally when we had this shopping experience online it was very unique because there were no standards and then Google came in and they created standards. You had to you get indexed you had to have this certain structure to get to a certain place. And so it homogenized an entire kind of e-commerce situation. He focuses on e-commerce but I think you could think about it the same from a B2B. So he's actually said that there's most websites aren't performing well and especially in e-commerce it doesn't work well to have the current structure that we do. Which is why he does argue that chat bots can basically take over that process and make a much more personalized experience so I do agree with you there. I will say that. He also said it was going to screw over Google which I thought was really interesting to think about. Yeah I have never really thought about that quite before but I can see that like okay somebody Googles red adidas shoes. Is there still a chat bot experience that's going to beat the experience of going right to a landing page offering you red Adidas shoes. You know maybe that chat bot maybe you get like "Hey we know you're here to see red shoes and here's a picture of them. Look good? Want me to order it? Yes. OK use your saved billing information? Yes." And you know that's really extensible to across Mobile. That can be put into a you know even an S.M.S. type format when you're going back and forth and that's one of the other things I love about chat bots right now too and some of these frameworks that are popping up around them is that it's really easy to build a bot in one place and then make it a Facebook Bot. Make it a slack bot. You know with some of the tools that are out there now to help connect those dots. I'm not saying that chat bots are going to take over the website experience for half the Internet in the next five years or six years or whatever but I think there's a lot of when people are coming to a URL for a predictable task or for something that might even be a broad swath of information it can be a great way to maybe send them to a corner of the website or send them to a Web site experience just for people that answer like, imagine if you could ask three really simple yes/no questions to every person before they actually went to your Web site, what power that could give you and the message that you're delivering them once they hit a landing page and chat bots make that really easy. Yes/No, Don't bump bump. And now you're really crafting that experience and that is where I think there's going to be a transition period where chat bots are like they are today really working in conjunction with your Web site and they're like helping support your operations. But I think for some task people are going to find like they just popped to a Web site and then BAM they go right to the chat bot. Because people are going to begin to get conditioned for like nuanced questions or something they're going to try to get to a person or are going to try to get to a chat bot to ask that and see what it says. That's fair and I think I was thinking about it from a full like Web site take over standpoint even though I know we said this is about landing pages. So I've got to get out of that. But yeah I agree. But I think the same principles that apply to landing pages are going to apply to those chat bots. You know you're not just gonna, for a detailed search query or some unique search query, fire them right into that generic chat bot experience. That's why I think marketers need to be really excited about chat bots because now it's this whole other division of conversion rate optimization that didn't really exist even three years ago I think it barely exists now honestly in terms of thinking really hard about just as much care as you put into that landing page you're putting into that welcome message that somebody seeing in your chat bot or your live chat. One thing that intrigues me about that. The idea of putting a lot of detail and focus into your landing pages is actually the idea of how you approach people from different countries that are coming different languages speaking different languages that are coming to your website. And I think that's something we haven't really thought about. I mean maybe we've thought about it we haven't put too much time into it because the majority of our customers can at least be partial English and get the idea of our website. But this idea that as chat bots get more advanced and they get more personalized and they're able to use AI and machine learning to, you know, even without human input to be able to better guide that conversation with a person. How do you deal with that person coming in with a different languages? Are the systems going to get so advanced that they can automatically translate the chat bot flow that you've created into a different language and that becomes seamless. Because I mean that whole idea is amazing to me because paying for translation services is expensive. Yeah and I think that is why this is a whole new realm. It's a brave new world of chat bots that a lot of these services are you know skills haven't even built yet in a lot of marketers yet. I firmly believe just as much as you if you're running a digital agency like a lot of our listeners are and you're thinking about your skill sets that you're bringing in the services you're offering. Just as you have a Facebook ad specialist you know you might want to consider having a chat bot expert on your staff. Companies like Drift that are sort of chat based focused are already offering like early partner programs that you could even you know get a revenue share of whatever client you might onboard with a chat bot. So I think that's an interesting way that you can look to offer more services. I know mobile monkey Larry Kim's new endeavor after leaving word stream. He's positioning that as an extra offering that agencies can use and build a Facebook Bot for your clients and charge extra on that. So I think there's lots of different ways you can look to kind of ride this wave as an agency to help your clients with these offerings and chat bots and participate in that rev share as well. I absolutely think there's some partially the reason why you need an expert as well just because of some of the limitations that you also are going to see coming up. One thing that really kind of struck me is like how do you have a chat bot experience for someone who's visually impaired? Is a strategist to be able to assist you with that? How does that kind of change the browsing experience? Now that's one very specific use case but something to think about from a strategy from a marketing standpoint. The other one that's really interesting to me and this goes a little far beyond marketing and everything but the idea is as more of these interactions start to occur with bots, is will there be a point where we can have bot to bot interactions where they just have a whole experience and then they just involve the humans at the end of it and how does that look? Yeah I think that's probably you're already seeing that in some cases when some of these virtual assistants talking to another virtual assistant and making it happen. I think probably on Twitter it's definitely happened where bots have interacted with each other where they're kind of trained to do a certain thing to a certain hash tag or something like that. So I think you probably seeing that started to happen we'll even see it more. So we've talked about some of the ways we've used our bot. Everybody's situation is going be unique/different. We've played around some tools over the last few months that you could probably use to get yourself started. So I've got two tools here that I can recommend personally from having used the first one we mentioned a bunch is Drift. So this is a really sales/marketing focused bot experience it's not customer support focused although I think you'll see them move into that pretty soon. It's really focus on booking demos for your sales team, getting people interested in your product, further information about the product, and what they're going to potentially see once they sign up for the product and get on your sales guys calendars just have their Drift bot booking deals for them. They've got some free trials that you can test out and get going. I can highly recommend them. They raised a bunch of money too so they're pretty well funded and going to be building great tech going forward. We are not sponsored by them in any way. We just really like them. Yeah. No it's been really fun. And then that's kind of the traditional bot you'll see pop up in the right hand corner your Web site. The other tool is lot less expensive a lot easier to kind of get in the door. But we'll give you a feel for creating a bot experience is Landbot. So Landbot.io it's a European company that has raised some funding recently. I've talked to their CEO, really interesting guy doing some interesting stuff, and they really believe that chat bots can take over the website experience for a lot of businesses and they've got a great visual builder for your bot and they've got really cool options to where you can have your bot experience either appear as just that little traditional you know box in the corner or you can embed it as a widget somewhere in your site. So maybe you want the buy experience happened in the body of the content of the site. You can do it there or you can even take over an entire page. So you can just drop their code in for your html code to your Web site and now your entire website is this bot experience and I've gotten side projects for some friends launched in hours that is up on a fresh URL. So some examples of projects that launched or where I do see this chat bot experience taking over is a friend of ours has a software platform for H.R. managers and one of the things age man army owners need to provide to their employees as an anonymous way for their employees to report incidents that happened at the workplace. So this company built a chat bot that any employee can go on and its name is Emma and Emma walks them through the five to seven legally required questions that H.R. managers need to ask during an incident report. It's handled completely through the chat bot they submit their information and that's an experience that worked really well because it's one specific goal to get through but you can launch a project like that in hours with Landbot.io and that's the best one I've seen right now to kind of get you going really fast. It's cheap, I think their highest tiers only 60 bucks a month or something like that drifts going to you a little bit more. I think they do two very different things. But there are some ways that you can get started to play around with chat bot and see if it's a fit for your website or your clients. So guys as Jon said you know we hope that you guys will try them out and let us know what you think. As always you know show notes with links to our emails our social profiles and more at blog.shape.io/podcasts so try it out reach out. Let us know. Yup we're still getting started still building that audience so tell friends, subscribe like Nicole said, and until we have a better sign off, over and out from Shape HQ.